If you are one of the millions of Americans who suffer from chronic or episodic migraines, a new Federal Drug Administration approved drug may be for you. Aimovig is a monthly injectable drug that is used to prevent the onset of migraine headaches. The drug targets the receptor molecule calcitonin gene-related peptide, or CGRP, which is involved in a migraine attack. According to the World Health Organization, 14 percent of the population suffers from chronic or episodic migraines. The FDA notes that women are three times more likely to suffer from migraines than men. Episodic migraines are characterized by migraines that occur anywhere between zero to 14 days a month. Chronic migraine sufferers experience headaches more than 15 days a month. Migraine headaches are often accompanied with symptoms of nausea, light sensitivity and vision problems. 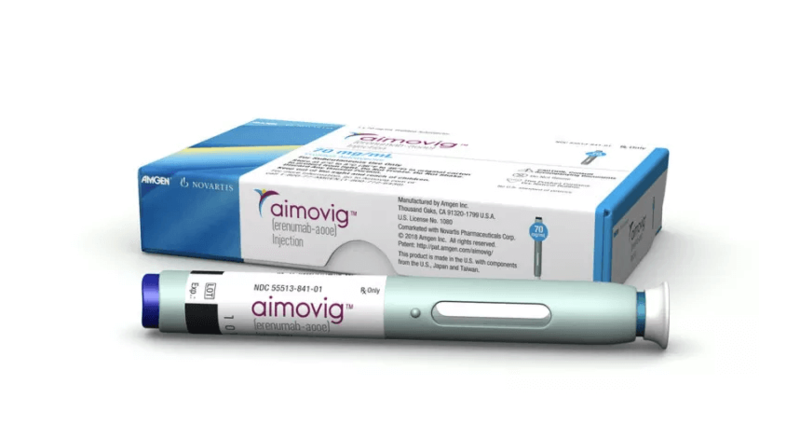 According to the drug manufacturer Amgen, Aimovig is in an auto-injector, similar to an insulin pen, and is available for $575 a month, or $6,900 annually. Amgen reported that the drug was tested in three clinical trials. In the first clinical trial, 955 people with episodic migraines were given either Aimovig or a placebo over a six-month period. People who received Aimovig experienced “one to two fewer monthly migraine days than those on placebo,” according to the FDA. In the second study, 577 of people with a history of episodic migraines were given either Aimovig or a placebo. Those who were given Aimovig reported experiencing one fewer migraines each month than those who were given a placebo drug. In the third study, 667 participants with chronic migraines who were given Aimovig reported an average of two and a half fewer monthly migraines. Few study participants experienced side effects, and those who did reported injection-site reactions and constipation. While the drug may help with migraines, further investigation into the drug’s side effects reveals that risk factors may include: liver toxicity, heart attack and stroke. That being said, researchers who study migraines and how they form are hopeful about the relief that Aimovig can provide.